Wheelersburg sophomore Aaron Jolly lines up for a free kick in their 1-1 tie Thursday evening versus the Minford Falcons. The speed of the Pirates proved to be too much for the Falcons to handle. Christen Risner completed a hat trick in Thursday evening’s contest, along with an assist in her team’s victory. Libby Miller also performed well in her team’s victory against Minford by scoring two of her team’s six goals. The Pirates final goal of the game was scored by Sophie Hagans, giving the Pirates the 6-0 victory. Wheelersburg’s next game will come against the Northwest Mohawks at home next Thursday at 5 p.m. The Lady Falcons will next face the Portsmouth West Senators at home next Tuesday night at 5 p.m.
Thursday night’s affair was nothing short of physical. 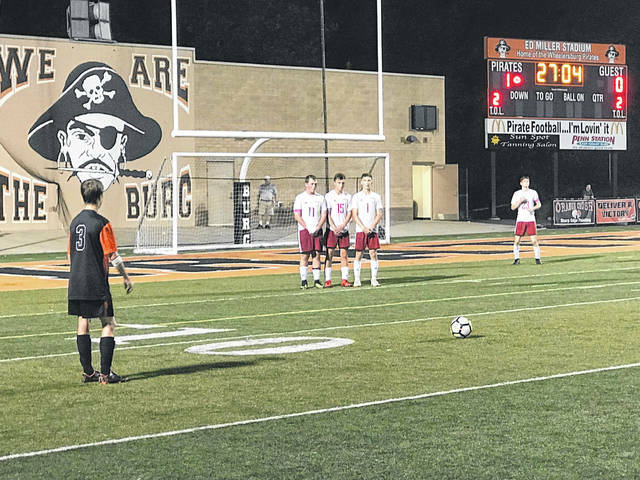 The game opened up quickly for the Pirates thanks to a Will Darling goal off of a throw in that gave Wheelersburg the quick 1-0 lead over the Falcons in the first five minutes of the match. Minford had a few opportunities to tie the game in the first half thanks to their forward play of Caden Banks and Brayden Davis. Banks missed just left of the goal on a run out with ten minutes left in the first half that would have been the equalizing goal. Just before the half, Wheelersburg sophomore Aaron Jolly missed just to the right of the goal that would have gave his team the 2-0 lead heading into the half. Missed goals by both sides would prove to be crucial to the final result of Thursday’s contest. Midway through the second half, with the game still in Wheelersburg’s favor, Banks and Davis had two more opportunities to tie the game that they were not able to capitalize on in that moment. That wouldn’t remain the case for long, however. With 11:30 left in Thursday night’s match, Brayden Davis scored on a goal assisted by Caden Banks after a scrum near the net. The game would end in a 1-1 tie, complicating things further down the line for the top of the SOC II standings race.